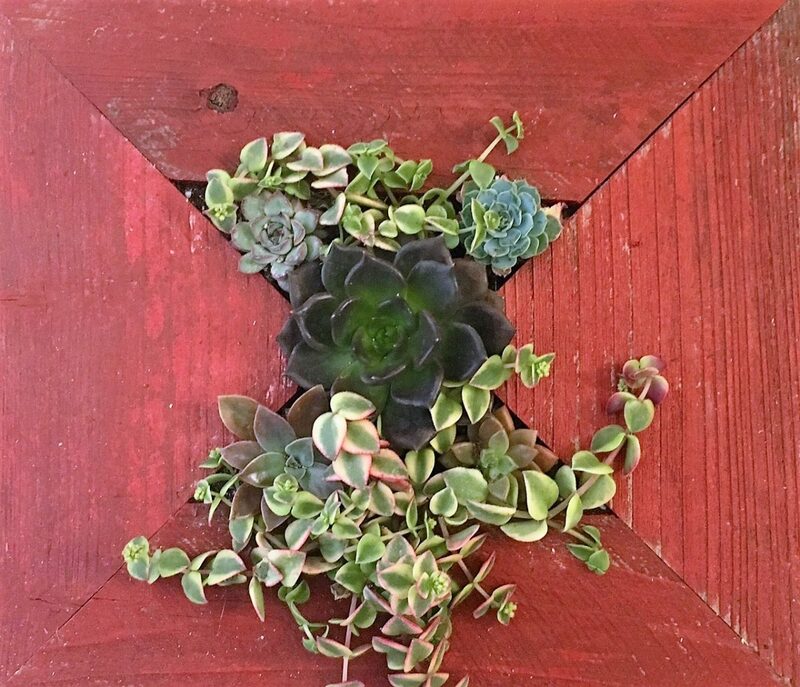 Your succulent purchase offers sustainability as well as simple beauty. Succulents are extremely drought tolerant and require minimal watering which is especially important for the vertical planters that hang on a wall. See our post on proper care and feeding of your succulent--you will be amazed at how seldom the succulent needs water. Talk about a "vacation-friendly" plant---both indoors and out! There may even be some exciting changes to your succulent depending on how much water you give her. Many succulent varieties turn pink at the leaf edges when they are especially happy and healthy. What succulents do need, however, is ample sunlight. They should be placed in a bright, sunny window. Insufficient natural light can be augmented by artificial lighting. A cool white fluorescent tube, or a combination of daylight and natural white fluorescent tubes will give good results. Position them 6-12 inches above the plants, and keep them on for 14-16 hours each day. Succulents are also extremely easy to propagate. We save the leaves and sprouts that break off and put them in dirt (we do use our special, hand mixed soil that has no chemicals and is the ideal mix for succulents, ask us about it! We are happy to mix you up a batch) and voila--a new plant is born. Cacti and succulents can be propagated easily by stem cuttings. Many succulents will form new plants from leaves which have been broken off. Allow the cutting wound to air dry before sticking the cutting into slightly moistened, sterile sand. Water sparingly since moisture retention is not a problem. When the roots have formed, transplant into the regular sand and potting soil mixture. Since cacti and succulents are diverse, feel free to call or stop by and talk to us about the specific requirements of individual species. Libraries and bookstores have many well-illustrated books to aid in plant identification but our resident Dane and designer, Morten Klinte can identify most for you at a glance and he's happy to provide tips and tricks for ensuring your succulent looks its best. In addition to the affordability and sustainability of having succulents in your home, succulents are also being used as crops for feeding livestock! Who knew? With its high water efficiency and content, cactus can sustain livestock through the driest of seasons. A well-developed root system also allows these versatile plants to grow in marginal areas where other forage species often fail. Compared to many other crops and fodder, cactus is easy to establish, maintain, and utilize. How cool is that? In addition to its use as a livestock feed, cactus is increasingly being cultivated for human consumption. Although the plant can be consumed fresh, significant value can be added through processing – providing dryland communities with extra sources of income and enhancing their resilience. This potential is significant: the plant can be pickled; preserved as a jam or marmalade; or dried and milled to produce baking flour. (visit the ICARDA site to learn more about how succulents are being used in highly arid climates for sustainability). We'll leave you with a little known fact about the role the Prickly Pear cactus has played in the development of crimson dye for clothing. The cochineal insect on the pads on the Prickly Pear can be scraped off, dried, and ground into a crimson colored dye for clothing and food. This was a common practice back in the 15th Century but we think it sounds like a great winter project and, of course, yet another reason to visit the desert. In fact, Amanda of California Homesteading uses it to make dye for yarn. Utterly stunning and 100% sustainable and natural.